Yasuni is the largest of Ecuador's 11 National Parks, while Galapagos is the country's oldest. Sea lions in Galapagos National Park. Ecuador is a South American country known for its diverse ecology. The nation is listed as one of the 17 mega-diverse countries of the world. Ecuador is home to several indigenous plants and animals. Owing to the countries’ natural wealth, national parks, and reserve areas have been established to protect the resources. Galápagos National Park is Ecuador’s oldest park. The other national parks are Cayambe-Coca, Cotopaxi, Sangay, and Yanusi. Yasuní National Park is Ecuador’s largest national park, covering an area of 3,793 square miles. It mainly occupies the Napo rainforest region of Ecuador. The park was declared a UNESCO biosphere reserve in 1989. It is said to have the most biological diversity on Earth. Yasuní National Park is inhabited by more than 100,000 insect species, 596 bird species, 150 amphibian species, and 121 reptile species. The park holds numerous world records for plant species diversity. In addition to all the plants and animals, the park contains approximately 20% of Ecuador’s oil reserves. Environmentalist and conservation agencies are against drilling oil in the park as it poses a threat to the environment. Other threats to the park include unregulated logging and over-hunting by local communities. Galápagos National Park was established in 1959 to become Ecuador’s first national park. 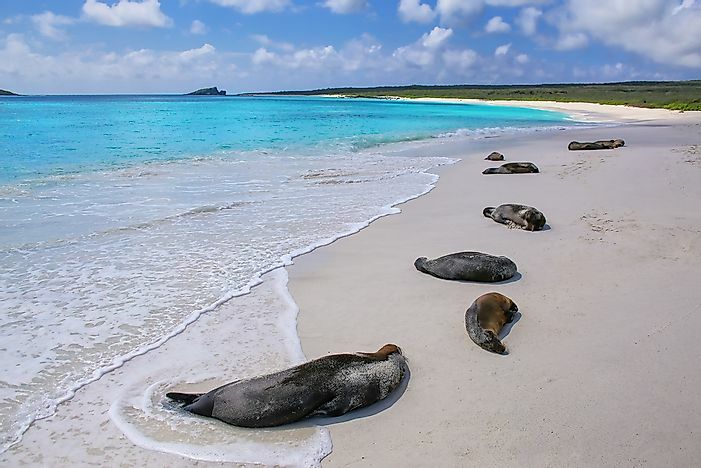 The park occupies 97% of the Galapagos Islands. It covers an area of 3,087 square miles. The park has some of the most original eco-system due to the limited access by humans. Unique animals such as the red-footed booby, Wolf volcano tortoise, and pink iguana inhabit the park. Bird species in the Galapagos include flamingos, cormorants, albatrosses, and penguins. UNESCO declared the national park a Natural heritage for humanity in 1979. The government of Ecuador has committed to preserving the resources within the Galápagos National Park. There are park officials and rangers who guard the park against human invaders. The local communities of Galápagos Islands are also involved in conservation efforts as they totally depend on the parks ecosystem. Sangay National Park is an isolated park in Ecuador. It occupies an area of 1,999 square miles. The park’s landscape varies from beautiful plains to magnificent glaciers. Additionally, the park has two active volcanoes. The different ecosystems in the park host a variety of rare plants and animals. Pumas, mountain tapirs, and Andean foxes inhabit the alpine areas of the park while jaguars, ocelots, otters, margays, and bears occupy the plains. Close to 400 bird species lives in the park. Sangay National Park was once marked as an endangered World Heritage site due to excessive grazing, illegal hunting, and unsustainable development projects in the park. Currently, conservation agencies have been established to guard the park’s resources. Podocarpus National Park is located in the southern regions of Ecuador. The park was established in 1982 and covers an area of 565 square miles. The park is listed as a mega-diverse zone due to its abundance of endemic plants and animals. Vegetation in the park includes acacias, walnuts, cedars, laurels, cactus, and castor-oil plants. The park accommodates endangered animals such as the mountain tapir, spectacled bear, jaguar and northern pudu. Over 560 bird species can be found in the park. Podocarpus National Park is a UNESCO biosphere reserve. Yasuni is the largest of Ecuador's 11 National Parks, while Galapagos is the country's oldest. Ecuador’s national parks and reserves protect the natural wealth of the country. The parks provide income to the country through eco-tourism. International organizations partner with the Ecuadorian government to preserve some of the richest ecosystems in Ecuador. The communities that live nearby the parks are also involved in the preservation efforts. This page was last updated on October 12, 2018.